If you are looking to build new commercial construction in the Pittsburgh, Pennsylvania area, start with Matthews Wall Anchor. The first step to any building is the foundation. Before you can start constructing the actual building, you need to make sure that the foundation is intact and properly installed. We can help you design a foundation that will remain sturdy for years to come. Our team of professionals, including structural contractors, is able to use their extensive background in commercial foundation construction and repair to building the foundation that is perfect for your needs. We can also work with your engineers and contractors for a seamless flow. These are some of the benefits of investing in new construction foundations from Matthews Wall Anchor. These design standards help to increase the functionality and stability of your foundation, leaving you with a great start to your new commercial or industrial construction project. You may think that new construction is safe from any sort of foundation problem. 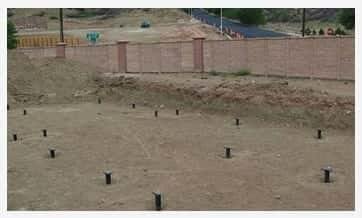 Generally, newly constructed foundations do not develop serious foundation problems. However, if the foundation was not put in properly, certain foundation issues may arise. Foundation problems may also occur if there is a severe storm or another catastrophe that affects your structure or the soil around your structure. If your new construction foundation in the Pittsburgh, PA area does need repair services, Matthews Wall Anchor should be your number one choice. We offer both repair solutions to fix foundation failure issues such as cracks, settlement, uneven floors, and bowing walls as well as cautionary measures for new foundations to prevent the occurrence of foundation problems in the first place. We use repair methods such as underpinning and piling techniques. These techniques are both used to provide the sinking foundation with more support underneath, where the soil that supports it has started to settle or fall away. 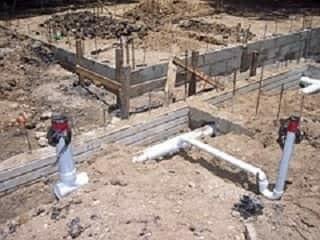 Another foundation repair solution is foundation shoring. This technique is more commonly used for shifting retaining walls and foundation walls. Whichever solution you choose for your new construction, you can be sure the repair will hold – we use quality products from the high-end brand, ECP (Earth Contact Products). We also focus on safety procedures that protect not only our workers, but also you, your structure, and future customers. We can build your new commercial construction a sturdy foundation complete with industrial floors and stabilizing underpinning solutions. Contact us right away for more information and to get a quote on your industrial or commercial new construction project. We also offer foundation repair services for new construction and commercial structures. The experts at Matthews Wall Anchor are proud to serve customers in the Pittsburgh, PA area.